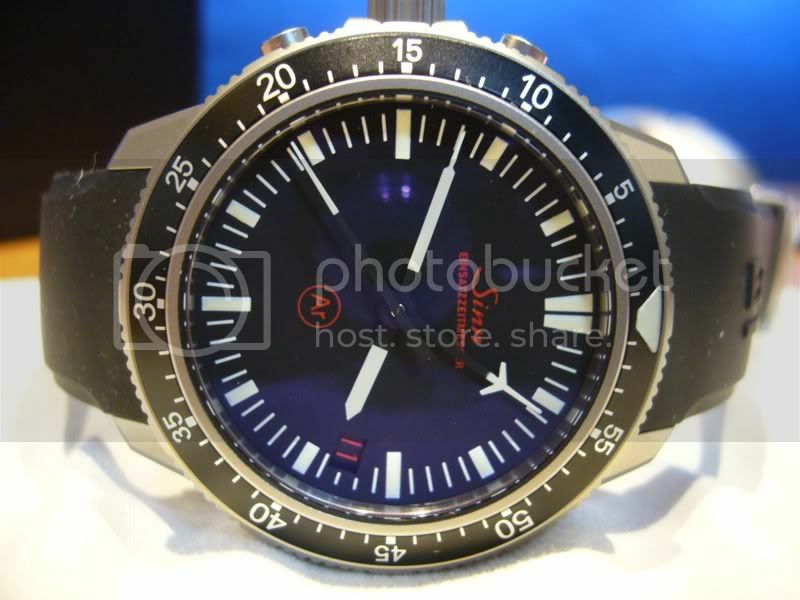 I am trying out a Sinn EZM 3 today (from Dave D on the Sales Forum earlier this week). I have taken it off the steel bracelet and it's now on a prototype ATG NASA-type nylon strap which looks like it was made for it - I had to buy something just to put it on! 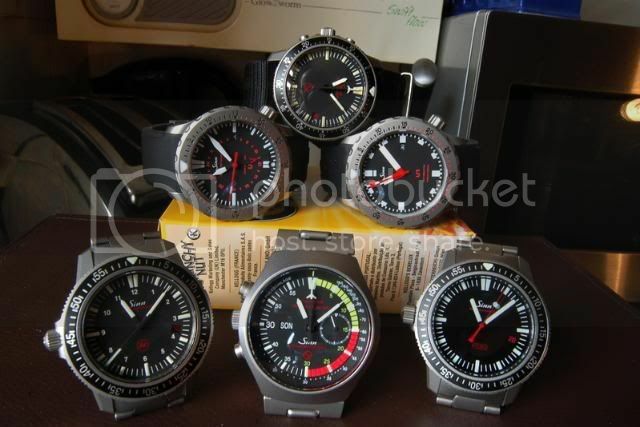 I gather that these EZM 3s are going to be discontinued soon (are they in the 2010 Sinn catalogue?) but this is going to be modified - black pvd case (I have found someone in the UK to do the work who I am trying out first on another project), different dial (probably EZM 1), hands (probably swords, perhaps use an EZM 1 chrono hand as the second hand too - not sure if the EZM 3's hands are the same as the EZM 1? 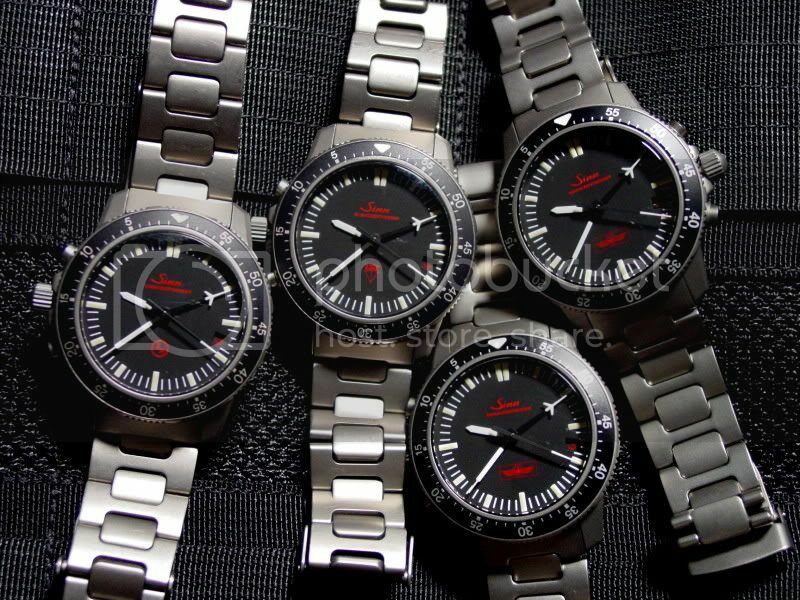 They look similar - see the photo below) and maybe switch the bezel. I have no interest in how deep this can go as I prefer flying to swimming! Sinn Einsatzzeitmesser 3 (EZM 3). 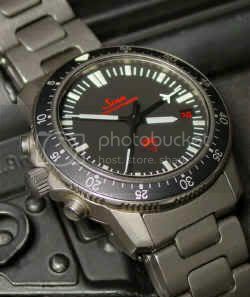 Used by elite German Grenzschutzgruppe (GSG-9) special forces in underwater tactical operations. Designed for extremely cold environmental conditions. Argon-filled watch cavity prevents fogging by eliminating moisture intrusion, and special micro-lubricating techniques allows for operation down to -45 degrees Centigrade (-95 degrees F). Specially compensated movement protects against magnetic interference. Reversed crown designed to prevent underwater snagging. A unique deep-water timepiece designed for extreme undersea environments. 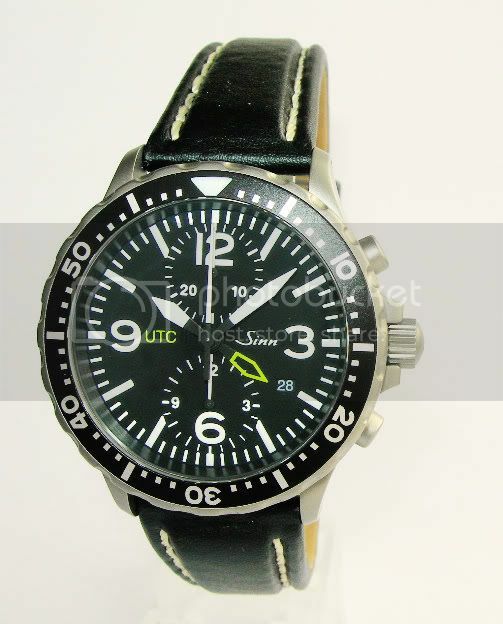 Sand-blasted stainless steel case, ETA 2824.2 automatic movement, anti-reflective and scratch-resistant sapphire crystal, hermetically sealed and screw-reinforced back, uni-directional elapsed time bezel reversed screw-down crown, quick-set date window, luminous hands and markings, shock-resistant, anti-magnetic, waterproof leather band, 50 ATM water resistance, presentation box. Width is 41 mm at excluding crown and 45 mm including crown, lug to lug is 47 mm, Thickness is 12 mm . In summary, a tough and cheap beater which will look even better once the pvd starts to wear on the high points of the case and it acquires some patina. Last edited by StampeSV4; 20-11-2009 at 17:10. There's definitely something about Sinn. Looking forward to seeing the results. Mat, as you mentioned on the Watch Discussion Forum, this project needs a name. Bearing in mind that the EZMs were originally designed for the German high security police and border commandos (see below), "Jagermeister" seems appropriate. Jagermeister means hunt-master or gamekeeper - here's the Wikipedia link http://en.wikipedia.org/wiki/J%C3%A4germeister. Perhaps more relevant, Jagermeister was our team drink at Bonneville and funnily enough, if you enter in Jagermeister in German in Babelfish, the English translation is "More Jagermeister", a phrase I heard many, many times! As well as a drink, apparently it was even used as a field anaesthetic in WW2, which I can well understand. Anyway, a bit more about the EZM which inspired this project; the EZM (Einsatz Zeit Messer) series was designed for two elite German law enforcement units, the Grenzschutzgruppe (GSG-9) Federal German Border Commandos and the Zentrale Unterstützungseinheit Zoll (ZUZ). The ZUZ Unit is a special law enforcement arm assigned to the Federal Minister of Finance, dealing mainly with high-risk customs investigations, organised crime and drug interdictions all over Europe. 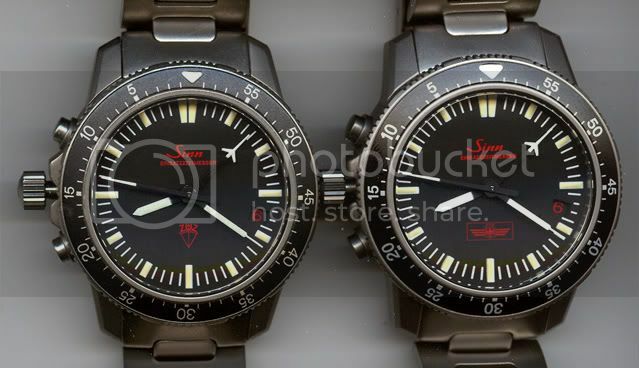 (It looks like the one on the right might have the later type of bezel with the larger lumed triangle? See text below). So what's the plan? 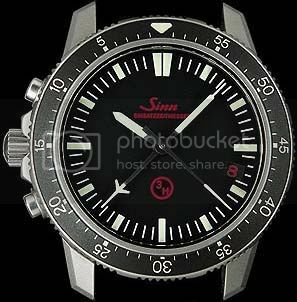 EZM 1 dial and bezel insert, sword hands as per 757 plus black pvd case, on a Sinn shark skin strap with black pvd buckle (assuming that those parts fit and I can obtain them). (I did consider using the EZM 1 chrono hand as a second hand but I don't think it would work with the sword hands plus it might look odd being used as a second hand alone since it does not have a counter-balanced end). Last edited by StampeSV4; 02-02-2010 at 23:27. Great name and great project. Project Koch might also be appropriate - given the H&K MP5 with 3-shot burst? My Re Issue EZM1 and I'll post one of my old 3H versions from years ago... I just found the pics..
Another great post and thread, Jon. Having an EZM-1 (just the re-issue) I am a fan of the EZM layout and "style", if that is the right word. I am looking forward to this project - should be very interesting. And funny reference to the Audi - I got it!! BTW fit may be a probelm for some of this, the EZM dial feet will differ considerably from those on the movement, and the 7750 hands may not fit the movement either (as the holes will be larger for the full stack of chrono hands). 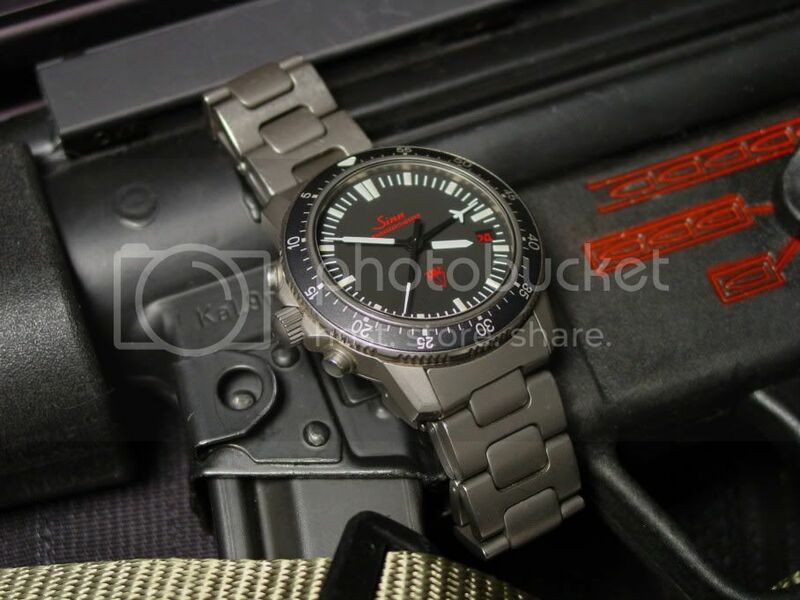 The existing seconds hand is almost identical design to the EZM1 chrono-second hand anyway, so no change needed there (I think), and you would prefer a countdown bezel to a 0-60? Thanks for the encouragement and tips. 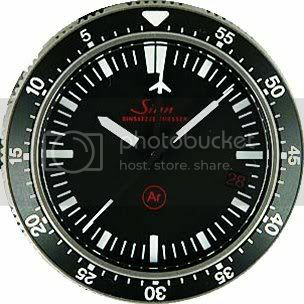 Instead of 757 hands someone has suggested those from a 656 as the dial diameter of that watch is the same as the EZM 1. Sounds like the dial could be a problem though which is a real shame, as the idea was to produce a really stripped down, stark and simple EZM 1-type Sinn without the complication of the chrono'. I'll let you know what Sinn say. If the dial is no-go, perhaps refinishing the white Sinn logo and small arabic numbers in red might work - a rendering of that idea has been posted elsewhere. The EZM 1 bezel insert is simpler and cleaner in design, so hopefully that will fit. Also thinking about anodising the chapter ring in red, rather than pvd? The crystal is to remain the flat one on it now, as it's more in keeping with the no-frills concept. Hope to see your EZM 1 on Thursday Dave? Aha Jon, the penny drops. Re-finishing the white indices in red could be very cool indeed, I hope that's possible, as it would make it distinct from either example. Some kind of finishing coat like a lacquer or similar. I suppose the EZM insert does use smaller font, which helps make it look a little less crowded.